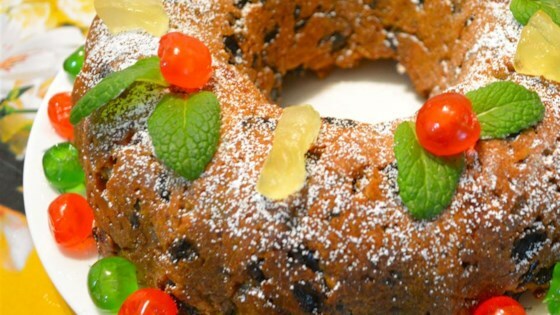 "A really good fruit cake recipe, one you can eat the same day you make it; it's even better if you let sit for awhile." Preheat oven to 300 degrees F (150 degrees C). Line a tube pan with 2 layers of brown paper or parchment, and grease well. In a large bowl, whisk together flour, baking powder, and salt. Mix in raisins, dates, cherries, pineapple, walnuts, and coconut. Stir until all fruit is coated. In another large bowl, cream the butter with the white sugar. Add lemon rind, lemon juice, and eggs; mix well. Stir in fruit mixture. Spread batter into prepared pan. Bake for 2 hours or until a tester comes out clean. Cool completely on a wire rack. You may substitute pecans or almonds for the walnuts, or use mixed chopped nuts. I am NOT a cook having to learn after my wife's death. But this recipe was easy to follow and it was FANTASTIC. It tasted like the fruit cake I have always eaten growing up. This is the first fruit cake I have ever made...it is wonderful! Very simple, and simply delicious.